Oral care is about more than making your pets’ smiles sparkle–it’s an important component of their overall health. In fact, 80% of dogs begin to show signs of oral disease by age 3. 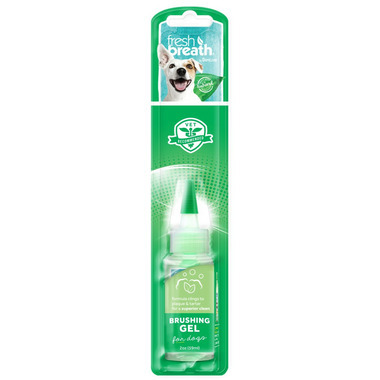 TropiClean Fresh Breath Clean Teeth Brushing Gel clings to your pets teeth providing a 360 degree clean as it helps break down plaque and tartar. Gently brush in a circular motion. Directions: Apply a pea size amount to a pet tooth brush or a finer brush. Brush in a circular motion. Ingredients: Purified Water, Natural Derived Alcohol, Glycerin, Carbomer, Spearmint, Natural Cleanser, Zinc Chloride (.01g/10ml), Green Tea Leaf Extract, Chlorophyll.